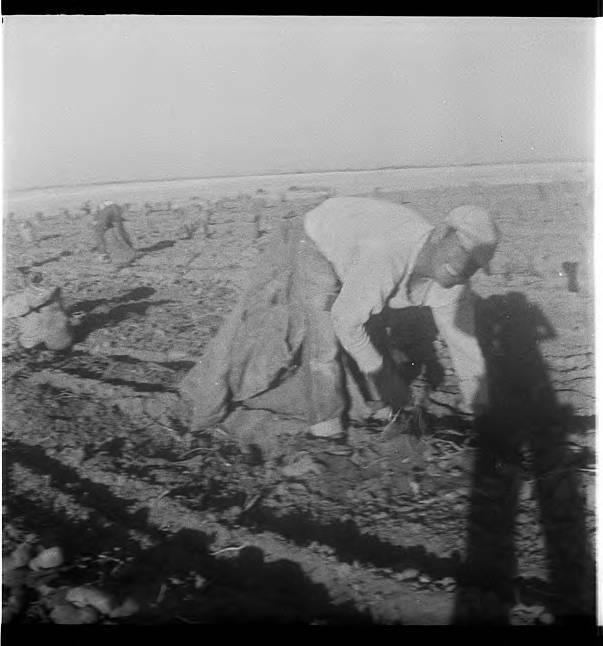 Black and white (overexposed) image of a man bent over as he pulls potatoes from the ground in a bare field. He wears pants, gloves, a long-sleeved shirt, and a hat. A burlap bag is suspended between his legs, held open by a wooden bar so that it can be filled with potatoes as he works his way down the row. Another worker can be seen in the left of the image, bent over as they also pick up potatoes. Filled sacks of potatoes are scattered throughout the field, and what appear to be a few potatoes are piled in the left foreground of the image. Museum records identify the man in the image as members of a group of 'potato pickers,' most likely migrant workers. Migrant farm labor has been an important part of agriculture in Washington County since the early 1900s, though the cultural groups which provide the majority of the laborers have changed over time.